Tactical Research by Belleville introduces the new Jungle Runner boot. Borrowing the best features of Vietnam Era jungle boots, the TR900 has key performance characteristics that include the highly sought after Panama outsole with added rappelling bars & 360° stitching around outsole to extend wear and increase durability. Additionally, new performance features such as improved water drainage make the TR900 ideal for tropical and wet environments. Two side instep vents provide excellent ventilation and increases drying times to keep your feet dry and cool when navigating through difficult territory. 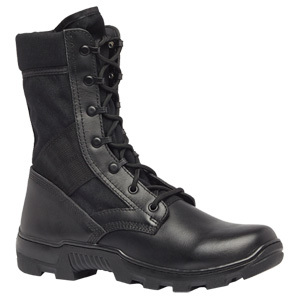 Tactical Research Jungle Runner Boots run 1/2 size smaller than the equivalent athletic or running shoe size. If you wear a size 10 running shoe, consider ordering a size 10.5.